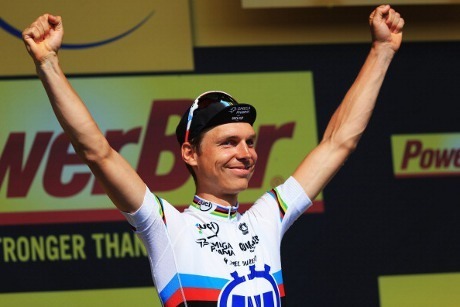 Mont-Saint-Michel – German rider Tony Martin became the fastest rider at the eleventh stage. Unpleasant incidents experienced rider Mark Cavendish Great Britain is thrown when the urine is in a race. Martin, who defended the Omega Pharma-Quick Step at the forefront finish time trial with a time of 36 minutes 29 seconds within which stretches along 33 km from Avranches to Mont-Saint-Michel. Rider 28-year-old is to appear dominant and far superior to the 12 seconds from Christopher Froome and more than a minute of the third occupant Thomas De Gendt. Froome is still retained the yellow jersey with a lead three minutes 25 seconds from his nearest rival Alejandro Valverde and three minutes 37 seconds of Bauke Mollema. While it is accepted that the misfortune of Cavendish. Teammate Martin was ill-treated with urine thrown by one of the spectators. “I regret this. I have always felt that cycling fans are manly men, men with a sense of enthusiasm,” said team manager Patrick Lafere who told Sky Sports.